Designed by Skacel, and fabricated by DellaQ, the Not So Plain Plane Knitter's Bag is a great way to travel in style with small knitting projects like socks, scarves and baby items. The bag is made from DellaQ's signature silk material (striped on the exterior with a purple lining) and features 7 interior pockets designed to hold your yarn balls, needles and notions. The draw string closure doubles as handles and keeps everything in place when the bag is closed, yet allows you to open the bag up very wide to work from. 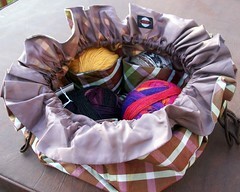 The Not So Plain Plane Knitter's Bag was designed to fit comfortably on your lap, making it a breeze to work from. It is very light weight and since it does not have a hard form, you can easily squeeze into your luggage when traveling or carry it over your shoulders as the long drawstrings double as handles. Work on your project directly from the bag in your lap, then when it’s time to go, just cinch up the drawstrings and you will be quickly on your way! I think the drawstrings are actually too long to carry as a shoulder bag and would knot them about half way up if I were going to carry it in this manner, however the length of them does allow you to open the bag up almost completely flat. Inspired by a small jewelry pouch, this much bigger version could also be used for many other purposes, such as an evening bag, a lingerie bag or even a large jewelry bag when traveling. It also reminds me of a Bingo bag that my Mom used to carry and as a result, the Not So Plaine Plane Knitter's Bag will be going to live with her. She'll be using it to tote her daubers, good luck charms and current knitting or crochet projects with her on Bingo night! Cat's Magical Markers, developed by Cat Bordhi, come as a set of 6 brass plated stitch markers labeled from A to F. Designed to fit circular needles up to US size 6, these markers can easily be slipped onto the needle or clipped over the cord in alphabetical order. I love the style of the open clips, which allow you to slip them on or off as needed. Schoppel Wolle's Zauberball (above right) was all the rage when I was at Stitches East last October (yes, I came home with one) and the unique single-ply sock yarn continues to gain popularity. 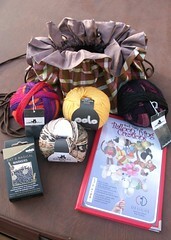 New to the Spring/Summer 2010 line is it's sister, the Lace Ball (above left). Zauberball, 75% superwash wool - 25% nylon, made it's debut last fall with 9 beautiful colorways. The Spring/Summer 2010 line adds 3 more to the collection, each one prettier than the next. 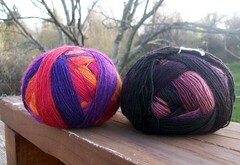 The 100 gram balls yield 459 yards of amazing color repeats. If you don't knit socks, there are some beautiful scarves that have been created with it! Lace Ball debuts as part of the Spring/Summer 2010 collection, to the awaiting "oohs" and "aahs" of lace knitters everywhere! Lace Ball is also a 75% superwash wool - 25% nylon blend and is available in the same 9 original colors of it's sister Zauberball. The soft lace yarn features long, gradual color changes in each 100 gram, 875 yard ball. Knitters know that sumertime is the right time for lace shawl knitting, so grab your needles, a Lace Ball and your favorite warm weather beverage, then head on out to chill for the afternoon in your favorite knitting spot! 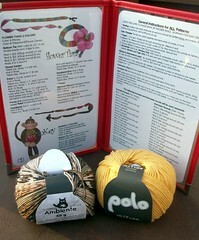 Schoppel Wolle's Ambiente (above left) is a 100% Merino, Extrafine Superwash wool that comes in 50 gram, 170 yard balls. This soft sport weight wool is great for everything from socks to baby items. Each colorway produces a unqiue print that adds some magic to your handknits - and gets those extra claps and "how'd you do that" comments. Zitron's Polo (above right) is one of Skacel's best selling cotton blends of all time and is a favorite of many top designers, including Lily Chin. 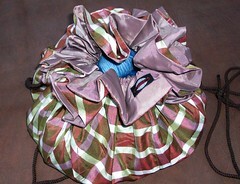 Polo is available in a variety of both solid and multi colorways and comes in 50 gram, 153 yard balls. The 60% Cotton - 40% Microfiber blend is uber soft, making it especially perfect for knit tops and precious baby items. Skacel has just introduced an ingenious set of patterns that has me on the edge of my seat ready to put some of my sock yarn stash to another use! The Sock Yarn Balloon Tying Creations (pictured above) patterns are inspired by/fashioned after balloon tied animals that you’d find at a fair or a child’s birthday party. These amazing little creatures are knit in the round, with specific increases and decreases that allow them to be tied (after stuffing) into their respective species. Sock Yarn Balloon Tying Creations includes patterns for 10 creatures in total, including a monkey, poodle, bumble bee and elephant. They are sold as a set, packaged in a handy, clear vinyl wallet that allows you to clearly see the pattern you're working from, while keeping it protected at the same time. I absolutely love this packaging and wish more patterns came like this. It is so much more handy and useful than boxes of pattern cards. Whether you're into socks, lace or baby knits, Skacel has something for everyone in their Spring/Summer 2010 line... as for me, I'm itching to cast on my first balloon creation! Oh, please, please, please cast on for the sock yarn balloon animal things. That looks like sooooo much fun! Squeee! Love that bag too! So different.